After 79 years, playoff baseball returns to Washington, D.C. — but is it too late for America's (former) pastime? What would hurt Povich more was that he never had a next time. After 1933, the Senators3 were often in or near last place. They never made the playoffs again. 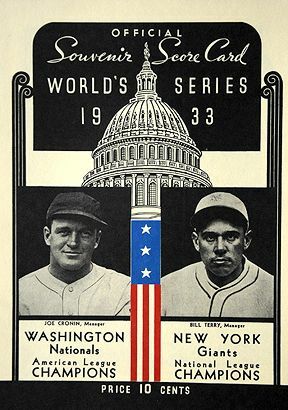 Even in the heyday of the game in the middle of the century, when baseball meant normalcy, when it meant the national pastime, baseball in Washington was something of a joke (“First in war, first in peace, and last in the American League”). I’m not saying the team didn’t have any fans — but at times it didn’t have many. At one game in 1954, a total of 460 people bought tickets. The Senators played their last game, before turning into the Texas Rangers, on September 30, 1971, against the Yankees. A total of 14,460 people came to watch — or to heckle. Crude banners fluttered from the upper decks, telling owner Bob Short, who’d cut a deal with Arlington’s mayor to move the team, to bypass Texas and head straight to hell. For a moment, though, the crowd forgot its anger, its sadness, its resentment. It followed only the ball. In the sixth inning, Frank Howard hit a deep home run, and for a few minutes at least, the small crowd responded with joy, roaring with adulation and with thanks. Rounding the bases, Howard did what he never did: He tipped his cap in return. The mob started to rush the field — why, a mob only knows. A loudspeaker announcement warning of forfeit if the game didn’t resume pushed the people back into the stands. Two-thirds of the way through the top of the ninth, though, with no runners on, someone ran out of the stands again and onto the field. He stole first base — ripped it right from the baseline — and ran. Another person followed, and another, and then the field was flooded with people. The players took shelter in the dugouts. An official announcement went out that New York had defeated Washington 9-0. The loss (such as it was) dropped the Senators to 63-96. The diamond was picked clean of its bases; numbers were pried from the scoreboard. The crowd took even the scoreboard lights. I t’s tempting to make too big a deal about the success of the 2012 Washington Nationals, to suggest that it means something important to the city. I want to say that. I want to say that because I am from Washington, and because I love the city, and because I wonder if baseball might offer something that the city needs. The shape of the district, after all, is a wrecked diamond. It’s a cliché to call Washington a divided city, but that doesn’t make it any less true. The land is divided into quadrants. The population is divided into transient inhabitants and natives, Republicans and Democrats, blacks and whites, rich and poor. D.C. has one of the highest levels of income inequality of any city in America. It can be ruthless, and it is sometimes violently so. But I love it, and now that I live in New York I miss it, because it is also slow, and tough, and resilient. One thing unites Washington, as one thing unites America: football. Washingtonians cleave to power, and football — even terrible Redskins football — is the most powerful sport in America today. I would like something important to happen to Washington that does not involve an electrifying quarterback suffering a concussion. But how can the Washington Nationals, promising only “mildly mad” fans, compete with RG3? The short answer, maybe, is that it can’t. I watched Game 1 of the National League Division Series at a D.C. sports bar where only a handful of the 24 televisions were tuned to the first playoff game for a Washington baseball team in 79 years. The rest of the screens, including the one with the huge projector, were showing football, even though the Redskins had lost hours ago. Alongside football, the baseball game appeared almost comically boring, no more exciting than watching shadows move across the grass. Then something happened. In the seventh, up by one, the Cards loaded the bases with nobody out, and Ryan Mattheus came in to pitch. Two pitches and three outs later, the inning was over — and the football fans were murmuring. The baseball game moved onto the big projector screen (though the audio stayed on football), and then we were all watching. Waiting. It was like we didn’t have a choice: We were tense with patience. In the eighth, a pinch hitter, Tyler Moore, reached for a sinker and lifted it into right field. Two runners came home, the Nats pulled ahead, the football fans erupted. Loyalty? There’s a saying about the nation’s capital: “If you want a friend in Washington, get a dog.” I thought of the saying and smiled. Then I turned my attention back toward the game, which had settled back into its slow motions. The shadows moved across the grass. The pitchers gathered their signs. The catchers set their targets. The batters flexed their knees. The outfielders shaded their eyes. Maybe the point wasn’t loyalty, I thought to myself. Maybe the point was patience. By the time the team took the field at Nationals Park for the start of Game 3 of the NLDS, the sun was high and hot. The air in the shade was just cool enough to make you feel your skin and to remind you of October. It was a little cruel of Major League Baseball to test the D.C. ticket holders by scheduling the city’s first major league playoff game in 79 years for 1 p.m. on a weekday, but the early start actually lent a sense of truancy to the crowd entering the stadium. A couple of kids wore bright-red Bryce Harper T-shirts and school-skipping smiles as they moved through the gates. Their fathers were talking about Stephen Strasburg. Of course they were talking about Stras. Everyone was tired of talking about Stras, but there was no way around it. The Nationals were putting their fourth-best starter, Edwin Jackson, on the mound in their third playoff game. Jackson — who had won a ring with the Cards last year — is not a bad pitcher. He can throw his fastball in the mid-90s. But he sometimes has trouble in early innings. Against the Cardinals only two weeks ago, Jackson allowed nine runs (eight earned), on seven hits and four walks. In one and one-third innings. And is still going on, hours after the game is over, on so many postgame shows. In Game 3, Jackson was not quite the disaster he was at the end of September. He managed to limit the damage in the first to one run. But in the second he threw a fat fastball to the rookie shortstop Pete Kozma with two men on, and Kozma rocked his hands back and launched the ball deep into left. Suddenly, Kozma was jogging around the bases and it was 4-0. Confusion settled over the crowd. A boo floated up, and then another. This is not what 45,000 people had come out for. The game had started with F-16s shooting over the stadium, with chants of “Let’s Go Nats!” Harper was wearing red contacts. The stadium was filled past capacity. The return of playoff baseball to Washington, D.C., wasn’t supposed to end up feeling like a sock in the jaw. The Nats finished the game 0-for-8 with runners in scoring position. They left 11 runners on base. By the time Michael Morse hit an easy fly to right field with the bases loaded in the fifth, the crowd’s bewilderment was almost a sound, a vibration. When the boos returned, they were full-throated. Long before the last merciful out, the crowd was streaming through the exits. It has taken some time for Washington to get behind its baseball team. Attendance at Nationals Park in 2012, a year in which the team earned the best record in baseball, improved over 2011 — but it still averaged just barely more than 30,000. Six games this season drew fewer than 20,000 fans. In fairness, for most of their existence, the Nationals have been horrible. It is hard to get too excited about a team that loses 100 games, has coaching turmoil, and constructed a stadium that cost $769.6 million. But while the Nationals were plodding through one bad season after another, their general manager, Mike Rizzo, was quietly building something, from the ground up. Of 43 players who appeared in at least one game for the Nationals this season, 16 came up through the organization. Most of the stars are Rizzo’s picks. These Nationals are young, and they are exciting, and I hope they keep winning. Washington likes winners. But what the Nationals really bring to Washington isn’t just the promise of October thrills. It’s an alternative to the kind of power that is prized here. Power in baseball is the ability to take it on the chin and keep taking it. It’s the ability to watch shadows moving across the grass. It’s hard to master, that kind of power — that patience. Baseball is slow: ball to bat, ball to glove, ball to hand, ball to glove. Sometimes, one wants to rush the field and tear it apart, to make something happen. Sometimes, at least, I do. Nats/Senators/Nationals — it was all the same back then. As a columnist and editor at the Post, Povich would become a legend, almost synonymous with Washington sports. The press box at Nationals Park is named after him. Two teams, actually: When the team left to become the Minnesota Twins, they were replaced by an expansion team.